With motto "Rainbow is the colour of my skin"
SINGAPORE (29th October 2014) – Asia’s first high fashion and lifestyle digital journal for the Asian LGBT community ELEMENT Magazine publishes its 10th issue alongside the launch of The Rainbow Campaign. In line with the upcoming Taiwan Pride Parade, renowned Taiwanese singer A-Mei will be fronting the campaign as well as appearing on the cover of ELEMENT Magazine. The only cover shoot that A-Mei is doing this year. With seven photographers and 20 participants from six cities in Asia participating in the Rainbow Campaign, ELEMENT Magazine hopes to share the universal values with the world that despite the differences in sexual orientation, LGBTs are fundamentally the same as everyone else trying to make the best out of what we have and longing for love. We hope to make an impact in our culture and gradually gain further acceptance in society. The Rainbow Issue will be launch by the end of October featuring exclusive interviews with A-Mei and every participant. The series of visually bold photographs that will also be exhibited in an LGBT bar in Shanghai called 390 Shanghai. 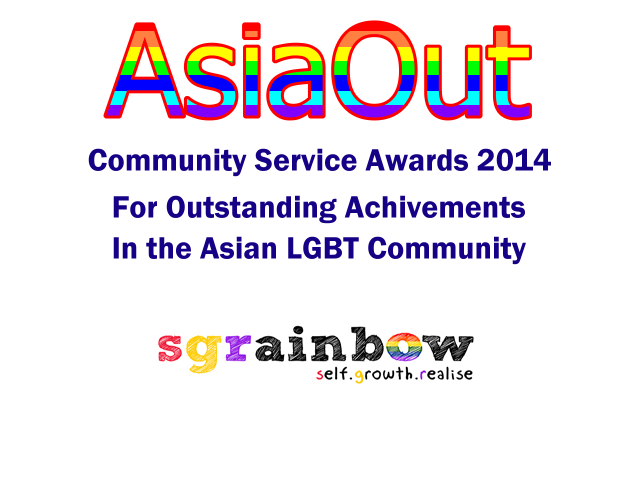 SGRainbow is a non-profit community social group for GBQ men aged 18 to 35 in Asia. It is currently based in Singapore.